Recently, students in fifth and sixth grade algebra took on a mighty challenge. 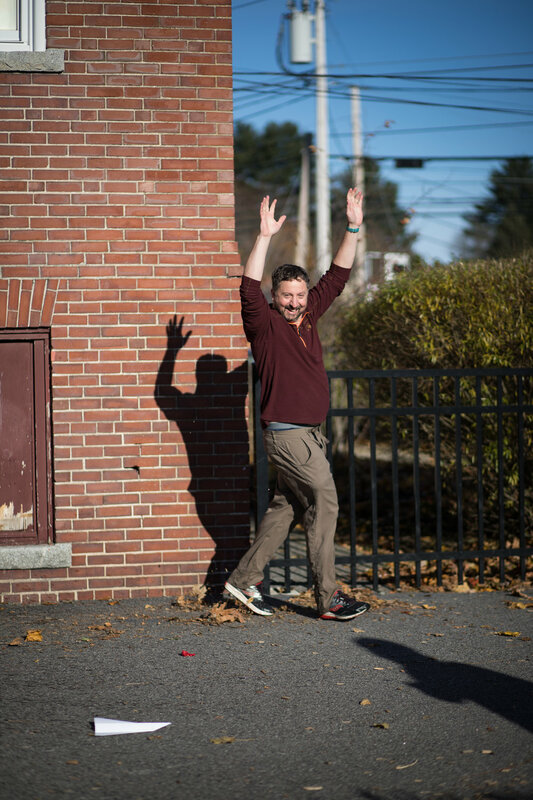 Could they solve an algebraic equation that would allow them to soak teacher, Tom Fisher by dropping water balloons from the roof of the brick building as he ran underneath them? In some math classes, you might find students sitting at desks working hard to make sure that “what you do to one side you have to do to the other.” At Breakwater we know that sometimes, valuable learning is achieved through a healthy mathematic challenge coupled with the rare opportunity to drop water balloons on your teacher early on a Friday morning in November. 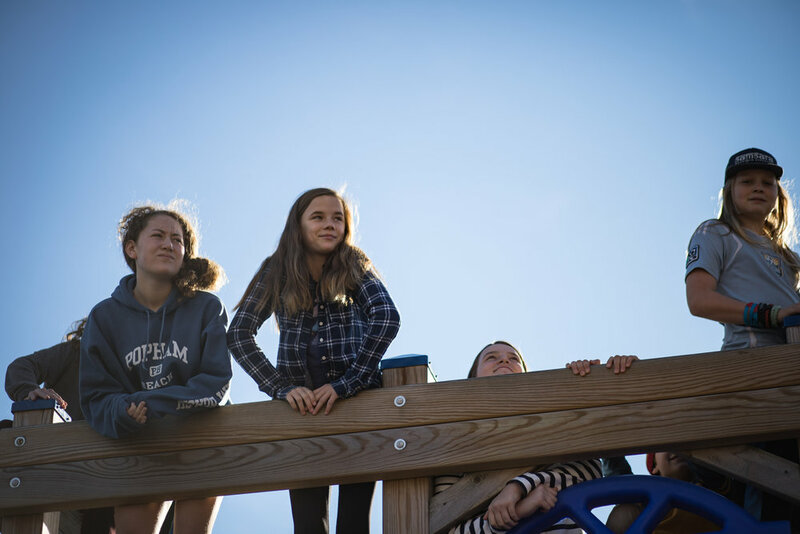 Here’s how it happened: After working through calculations the past few weeks in class, Algebra students made their way to the roof to prepare for the onslaught. 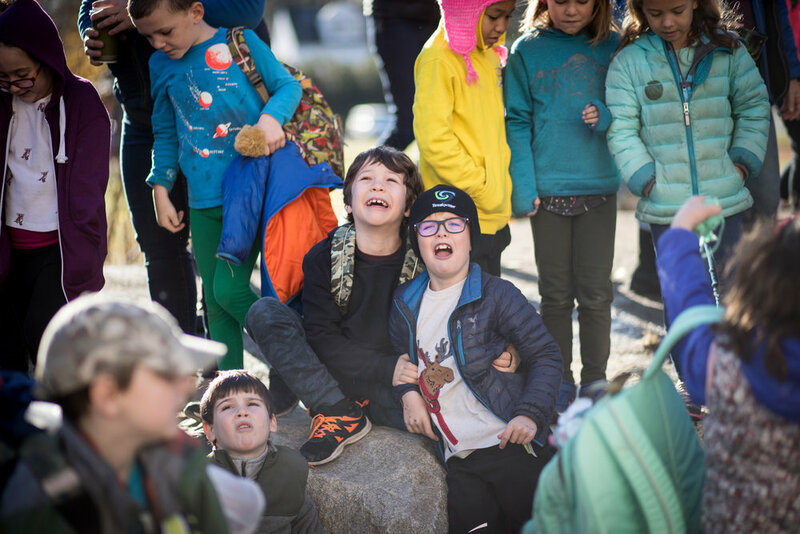 The entire Breakwater community gathered to cheer on the mathematicians and chants of “soak him!” and “get him wet!” could be heard near and far. Tom was brave and smiling (because he likely knew which of the calculations might be more likely to soak him!) Tom found his starting point, ran underneath the path of water balloons and either skirted by or did in fact, get wet. It was a meaningful experience for all of us and an engaging lesson into the power of math. Thank you Tom, for your creativity, engagement and constant desire to inspire kids into learning through games, novelty and good, old fashioned fun. If you aren’t lucky enough to know Tom, he is also very thorough and wrote out a guide below if you’re interested in learning more about the work behind his algebraic magic. 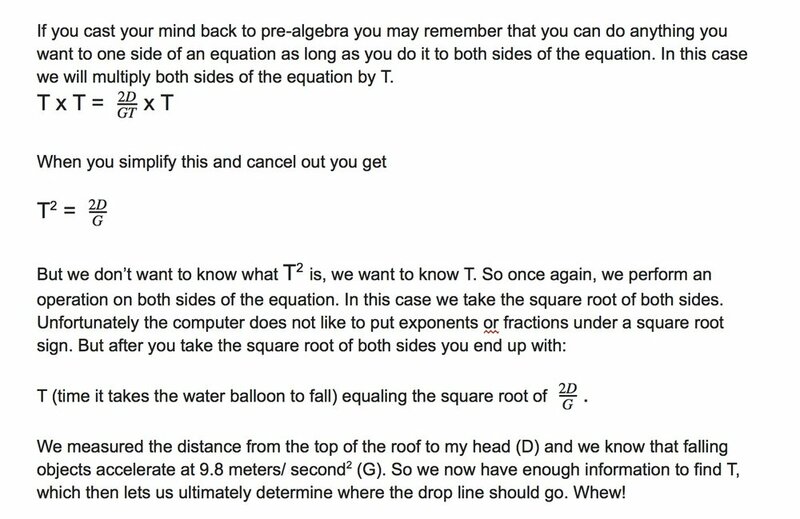 From Tom: Students in the algebra class were given the challenge of dropping water balloons off the roof of the brick building that would hit me as I ran along the side of the building at a constant speed (or at least as constant as I could make it). Rather than trusting to their best judgement, they had to use algebra to figure out where to put a line that, when I crossed it, they would drop their balloons (The drop line). At first this seems like a straightforward problem. Distance equals rate times time. For example, if you imagine a car traveling at 40 MPH (rate), and it travels for 2 hours (time), it will travel 80 miles (distance). Forty times two equals eighty. So, if they know my rate and they know how long the balloon will take to drop from their hand to a spot 5’8” (my height) above the ground, they can just multiply those to find out how far away from where the balloon will hit they should make the drop line. However, two things complicate the problem. The first is reaction time. 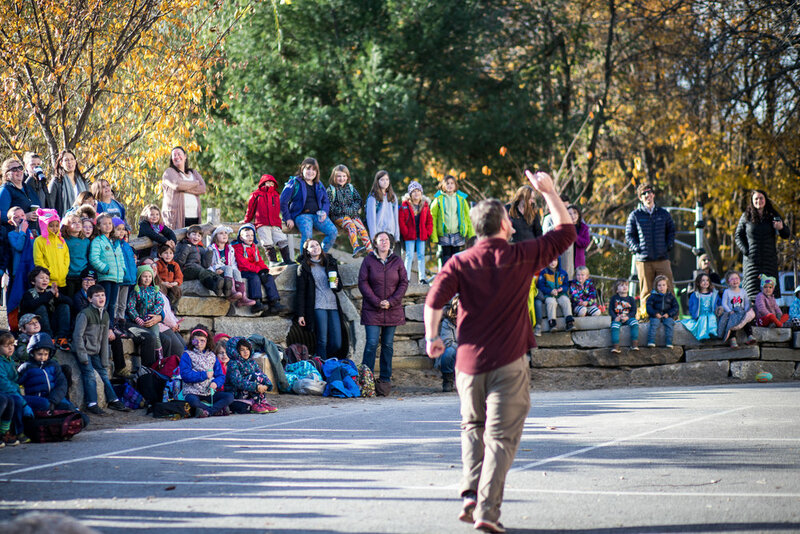 There is a lag between when our brain notices it’s time to drop the balloon and when our fingers let go. It’s about 0.25 seconds for most of us. The other, which is much more difficult to figure out, is figuring out how long the balloon will be in the air. Students were allowed to measure the height of the brick building, but not allowed to time how long it takes an object to fall off of the building. This is particularly tricky to figure out because a falling object does not have a steady speed. It continuously accelerates until it hits. Read on if you are interested in how this is determined and you like methodically working your way through a puzzle. Because we are trying to figure out the time that the balloon will be in the air, we start with the formula that time = distance divided by rate. We know the distance, so all we have to figure out is the rate. The problem is that there is no constant rate. The balloon will accelerate as it drops. To get around this we can think of rate as average rate. After all, a car that travels 20 MPH for 10 minutes and then travels at 40 MPH for ten minutes, takes the same amount of time for a trip as a car that travels 30 MPH the whole way. So all we have to figure out is the average rate. But how do we know the average rate? This is a little tricky. Because the balloon accelerates smoothly rather than in stops and starts, there is some moment during its drop when it is traveling at its average speed. When it is higher than this spot, it is going slower than the average speed. When it has fallen below this spot it is traveling faster than its average speed. The crude diagram below might help picture the balloons speed as it falls. Letters and numbers in black show speeds slower than the average. Red shows the average speed and blue shows speeds faster than the average. Imagine that the average speed is 5 (The units don’t matter in this hypothetical example). 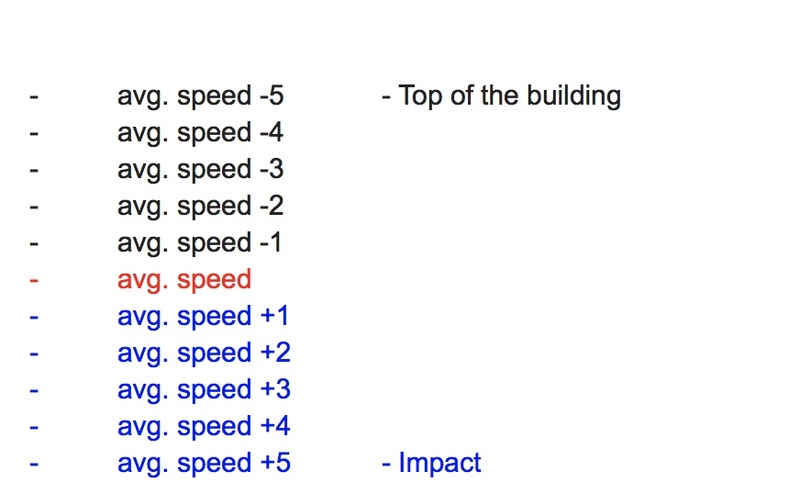 Notice that the initial speed would be 0 and the top speed (maximum velocity or Vmax) would be 10. Therefore the average speed would be half of the top speed. This will always be true. So if you can find the top speed, you can find the average speed. It will be the top speed divided by 2. So now we just need to find the top speed. Well that’s just a matter of multiplying G (This is acceleration due to gravity which is 9.8 meters/ second squares or 9.8m/ s2) by how long the balloon will be in the air (time or T). But we don’t know time! This is where you would be stuck without algebra. But let’s try writing it all out. I love this problem because it cannot be solved without algebra, it looks impossible, it’s fun, and it is a prime example of solving something very difficult one step at a time. If you are still reading at this point, give yourself a gold star.